Chelsea defender Cesar Azpilicueta was hammered on Twitter this evening for his poor display for the Blues in their match against Crystal Palace at Stamford Bridge. The home side won the match 3-1 thanks to goals from Alvaro Morata and Pedro, a win that now means the west London side sit 2nd in the league, just two points behind leaders Man City. Despite the result, some Blues fans weren’t very happy with Azpilicueta at all, and some even took to social media to let their feelings known about the Spaniard. Azpilicueta has been one the club’s best players ever since he joined them from Marseille back in 2012, however this season, things don’t seem to be going to plan for the defender. The Spanish international has struggled somewhat with playing at right back so far this year, with his performances looking nowhere near that of the ones he put in whilst playing at centre back under Antonio Conte. 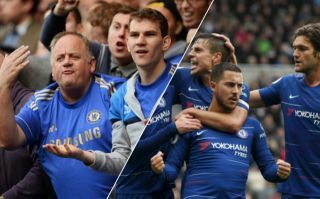 During and following their side’s win against Palace today, Blues fans took to Twitter to berate Azpilicueta for his performance this evening. He wasn’t THAT bad, was he? I haven't see azpi perform awful like today before. Azpi also out here putting in a 0/10 performance today. Been poor all season. Moving away from the Premier League, and you can catch AC Milan taking on Udinese in Serie A this evening by click THIS LINK here! Enjoy!